The focus of this study was to assess patient outcomes using a predetermined algorithm based on managing ERCP-related duodenal perforations according to the mechanism of injury. We focused our study on patients who had their perforation detected post procedurally. This manuscript is the first to validate an algorithm for the management of ERCP-related duodenal perforations. Our algorithm is logical and simple to follow. By following the algorithm, the length of stay and mortality rate are approximately half that reported in the literature to date. Prior studies have only created algorithms based on a small series of patients. This is the largest study to date with 61 patients with Stapfer type I or type II perforations; the most clinically severe. Our results support the belief that Stapfer type II perforations should be managed medically and this will likely have tremendous clinical relevance to those that perform ERCP and/or manage patients’ post-ERCP. Figure 2. 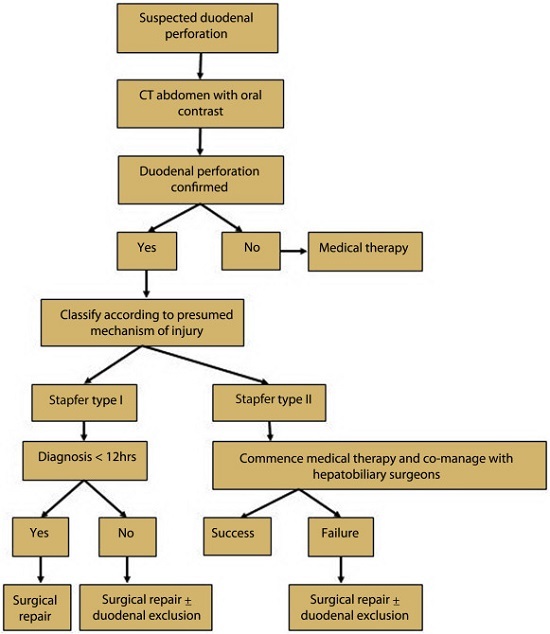 Institutional algorithm used for the management of ERCP-related perforation. Despite our study cohort having patients with severe perforations, patient outcomes were excellent with a short mean LOS of 9.6 days and a low mortality rate of 3%. Time to diagnosis greater than 28 hours was associated with statistically significantly longer length of stay. A new finding in our study was that extension of sphincterotomy using electrocautery was associated with perforation, likely due to distortion of normal anatomical landmarks. With regards to post procedure patient progress, we found that systemic inflammatory response syndrome (SIRS) was seen in less than 1/3 of patients. Moreover, our study challenged the belief that patients with SIRS will not respond to medical therapy and this insight may help reduce the number of patients with Stapfer type II perforation undergoing surgery.